(2005) "I Don't Feel Like Loving You Today"
"All Jacked Up" is a song co-written and recorded by American country music artist Gretchen Wilson. It was released in August 2005 as the first single and title track from the album All Jacked Up. On the U.S. Billboard Hot Country Songs chart dated for August 6, 2005, "All Jacked Up" debuted at number 21, setting a record for the highest ever debut by a female artist on the country charts. The last female artist to hold this record was Shania Twain, whose "I'm Gonna Getcha Good!" debuted at number 24 in 2002. Gretchen Wilson's record has since been broken by Carrie Underwood's "So Small", which debuted at number 20 on the Billboard country chart dated for August 18, 2007. Wilson wrote this song with John Rich and Vicky McGehee. The music video premiered on July 29, 2005 and was co-directed by Wilson with Deaton-Flanigen The video features cameo appearances by Kid Rock, Hank Williams Jr., Charlie Daniels and Larry the Cable Guy, who appears as both himself and an angry transvestite. The song debuted at #21 on the U.S. Billboard Hot Country Songs on the week ending August 6, 2005. 1 2 "Chart Beat". Billboard.com. Archived from the original on 29 September 2007. Retrieved 2007-08-20. ↑ Coyne, Kevin John (2005-08-04). 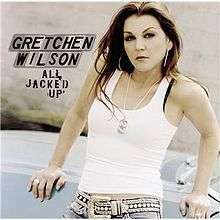 "Gretchen Wilson - "All Jacked Up"". Country Universe. Retrieved 2010-06-17. ↑ "Best of 2005: Country Songs". Billboard. Prometheus Global Media. 2005. Retrieved July 11, 2012.